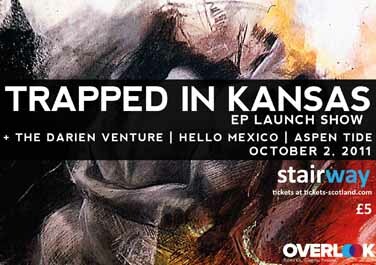 Trapped In Kansas launch their upcoming EP, How To Go, at The Stairway Club on October 2, support comes from The Darien Venture, Hello Mexico and Aspen Tide, tickets £5. Ben Butler & Mousepad is the support for the Remember Remember album launch we told you about a wee while ago at Stereo on September 24. 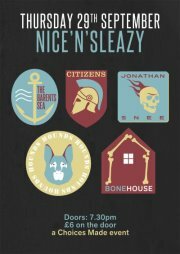 September 29, The Barents Sea, Citizens, Jonathan Snee, Hounds, Bonehouse at Sleazy’s, £6. 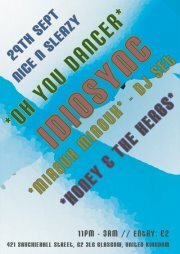 Idiosync has a pretty cool looking up coming for September 29, it includes Oh you dancer, Honey and the Herbs and Miaouz Miaoux at Sleazy’s in the club slot. Edinburgh School For The Deaf and Silver Caves support Craft Spells at the Captain’s on October 13. Where We Lay Our Heads are supporting I’m From Barcelona at the Arches on September 17. North American War have been added to the line up for the Ut, Divorce gig at Stereo on September 28. Little Kicks next gig is at Stairway Club on September 23.